Mark Semisch grew up near Jenkintown, the son of Donald A. Semisch, who founded the family firm, and Kathleen Robb Semisch, an elementary music teacher. 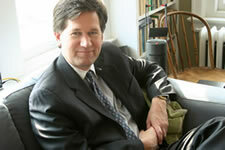 He attended The College of William and Mary, earning his bachelor's degree in English and Philosophy in 1982. He met his wife, Katherine, during freshman orientation when they were both seventeen years old. Upon graduation, and with a wife and two children, Mark moved up to The Marshall Wythe School of Law at The College of William and Mary, earning his law degree in 1986. While he studied, he supported himself and his growing family by working as a wine steward and waiter at The Williamsburg Inn. He passed the bar exam on the first try. He has a reputation as a superb listener and stalwart support, honed through many years of marriage and in caring for his three children and one grandchild. He volunteers his time in the community playing in the first violin section of the Bucks County Symphony and as a member of the board of the Musical Arts Academy of Bucks County. He is an intrepid traveler, an enthusiastic tennis player, a devotee of all kinds of music, and never met bottle of dry French wine he didn't love. Mark's clients, family, and friends know him as a problem-solver, the kind of person who naturally smoothes the way of others, a cool head in a crisis, and a genuinely kind and caring presence.